Looking for online Ninja training, self-defense, or personal development instruction? ... even if you live half-way around the world! Even if you can't make it to one of our conventional live seminars, now you have the opportunity to take part in both free webinars and on-going full-registration courses and programs. ...there's no reason to not get the training you want and need! Every month, Warrior Concepts offers online Ninja training seminars on important topics for the serious student. Each webinar is taught live aand recorded to make it as easy as possible for you to enroll and get this powerful training. Topics are divided between Self-Protection and Personal Development. Typically, our monthly events are split so that one event will focus on the personal protection aspects of the training, while the second focuses on self-improvement. Subscribers of the Warrior Concepts Self-Defense Newsletter receive full details of upcoming events as soon as they are available. So, make sure that you're not only a regular subscriber, but also that you READ each issue to make sure you don't miss out on any of the great topics being offered. 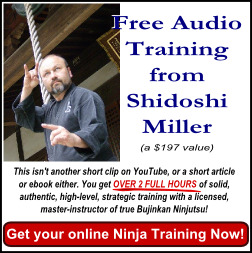 "The Traditional 8-Gates of Ninja Mastery"
Learn more... by clicking here. Single 1.5hr class and includes Student Manual. Who Can Take Advantage of This Powerful Online Ninja Training? If you're not a subscriber to the newsletter when you register, you will be prompted to Opt-In. As long as you're an active subscriber (you haven't opted-out) at the time of the online ninja training webinar you want to attend, you're in! Simply click on the link below to go to the online registration form. Complete the required information and, if you'd like, add a comment, question, or suggestion that you'd like to see as a part of the information being covered - either at this event or in a future one. Register Now for an Upcoming Online Ninja Training Event!